There is beauty in transformation and change. So often the Australian landscape has been a marker of our national psyche, as well as reminding us of the cycles of life, and our own mortally. Do we take the time to allow the Sublime to be revealed to us? Does it exist if we have to go looking for it? The Cowl Incident brings into question our changing relationship to the natural environment, and how technological innovations are altering those connections. A time-based videowork, in which the artist returns to the original location (‘the cowl’) to shoot the landscape as it transforms overtime via the hand of man and nature. Sound design by Brendan Croxon. IMAGES | Paula Binnie, The Cowl Incident, 2014-5, video still| Images courtesy of the artist. The Cowl Incident brings into question our changing relationship to the natural environment, and how technological innovations are altering those connections. A time-based video work, in which the artist returns to the original location (‘the cowl’) to shoot the landscape as it transforms overtime via the hand of man and nature. I went in search of answers to understand my reading of the Australian landscape. The land remains one of my lead inspirations and often my first port of call when making work – even if the final work shows none of this. There is something about ‘its’ unlimited potential, its iconic status, history, myths and legends that have emanated from it– a location where many an incident has occurred. I captured a large bonfire, a number of them actually, which were lined throughout the cowl (The term ‘cowl’, refers to a low lying area on the land that catches water run off, and is a local term, specific to the area of Warren), so that from my single camera angle I could watch them burn down at various intervals. The result was simultaneously beautiful, awe-inspiring and exhilarating. 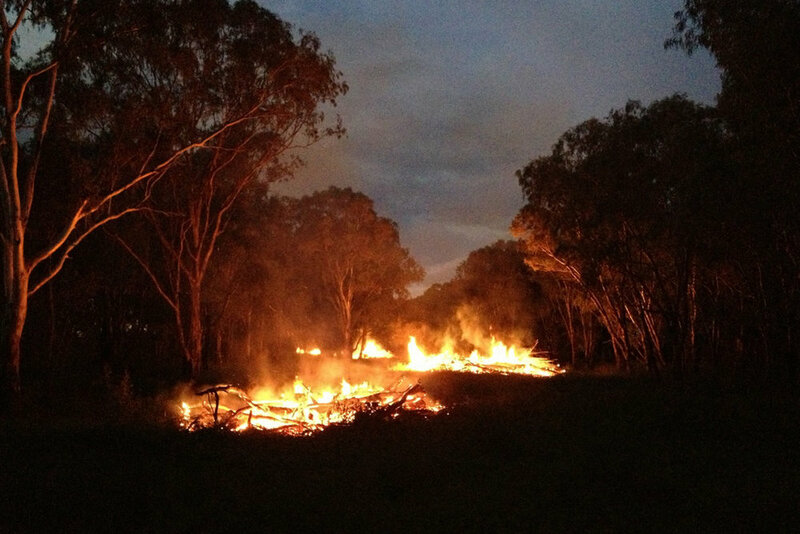 The mesmerising effect of fire was inescapable, as were the changes in light and chorus of wildlife. During one of my trips to Warren a tragic murder took place on Talga Lane, Croppa Creek, a small community near Moree, not far (in rural terms) from Warren. A farmer shot an environmental officer. The bush not only continues to evoke themes of struggle and survival – it continues to be a site of struggle and survival. This incident informed my need to capture a ‘momentary effect’, not simply to capture a general impression of colour through the camera, but to hold and contain the symbolic and existing nature of the Australian bush.